Nothing tastes better than homemade pasta and sauce. This lamb ragu and spinach fettuccine dish is one of my favorites, especially since the Dude and I only make it a few times a year. It has now become a tradition for us to prepare it every New Year’s Eve. If you give this recipe a try, I assure you, this pasta dish will quickly become one of your favorites. This recipe for spinach fettuccine is actually a combination of two recipes we discovered from Chefs Mario Batali and Thomas Keller. After several attempts to make the perfect pasta dough, we’ve come up with this recipe. 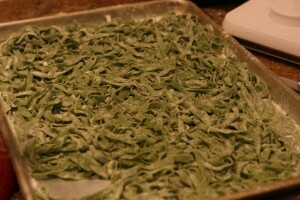 Why spinach fettuccine? Well, there’s never anything wrong with throwing a little green in your food. Spinach is one of the world’s best foods for you and we think it adds a delicious touch to pasta dough. Try to use organic and local ingredients. I also prefer to use cage-free, local, and organic eggs. Start by sauteing a handful of spinach with a touch of olive oil and minced garlic. Saute until wilted. 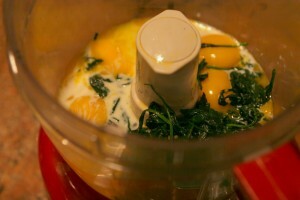 Add the sauteed spinach to the “wet” ingredients (egg, egg yolks, olive oil, milk) to your mixer and pulse. This mixture can easily become mayonnaise, so just use the pulse setting until evenly mixed. Once the mixture is complete, mound the flour on a board or other surface and create a well in the center, pushing the flour to all sides to make a ring with sides about 1 inch wide. Make sure that the well is wide enough to hold the mixture without spilling over the sides. Pour the mixture into the well. Use your fingers to break it all up. Still using your fingers, begin turning the mixture in a circular motion, keeping them within the well and not allowing them to spill over the sides. This circular motion allows the mixture to gradually pull in flour from the sides of the well; it is important that the flour not be incorporated too rapidly, or your dough will be lumpy. Keep moving the mixture while slowly incorporating the flour. Occasionally push the flour toward the eggs; the flour should be moved only enough to maintain the gradual incorporation of the flour and the eggs should continue to be contained within the well. The mixture will thicken and eventually get too tight to keep turning with your fingers. When the dough begins thickening and starts lifting itself from the board, begin incorporating the remaining flour by lifting the flour up and over the dough that’s beginning to form and cutting it into the dough. 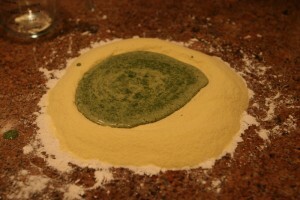 When the remaining flour from the sides of the well has been cut into the dough, the dough will still look shaggy. Bring the dough together with the palms of your hands and form it into a ball. It will look flaky but will hold together. Dust the clean work surface with a little flour. 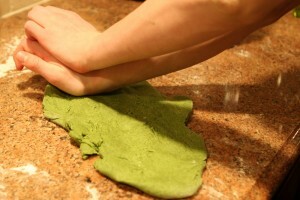 Knead the dough by pushing against it in a forward motion with the heels of your hands. Form the dough into a ball again and knead it again. Keep kneading in this forward motion until the dough becomes silky-smooth. The dough is ready when you can pull your finger through it and the dough wants to snap back into place. The kneading process can take anywhere from 10 to 15 minutes. Even if you think you are finished kneading, knead it for an extra ten minutes; you cannot over-knead this dough. It is important to work the dough long enough to pass the pull test; otherwise, when it rests, it will collapse. 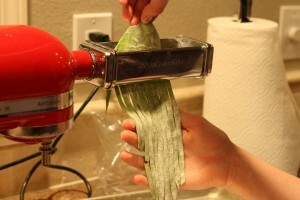 We prefer to make this dough into fettuccine using our Kitchen Aid pasta attachment to our mixer. It’s important to run the dough through the attachment a few times to create the perfect texture. If you don’t have one of these tools, just flatten the dough thinly by hand and use a knife to cut thin strips of dough. Looks so good, you’ll be tempted to eat it raw. Please don’t. Salmonella isn’t kind. This recipe comes courtesy of Chef Ryan. Remember him from This Ain’t Yo Mama’s Turkey blog post? I have a side-note about that turkey – I’ve now prepared that turkey recipe twice, for over 20 people, and every single person has told me that the turkey and gravy is the BEST they have ever had. I give full credit to Chef Ryan. 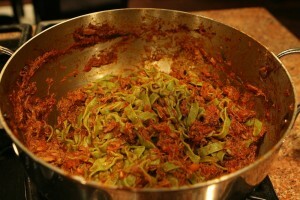 Chef Ryan gave us this lamb ragu recipe about 4 years ago and it’s one of our favorites. I feel like I’m in Tuscany every time I eat this masterpiece. Try it for yourself and you’ll understand. Again, it’s best to use local and organic ingredients. For the lamb, organic, free-range, and grass-fed is best. Another note about lamb – for those of you who have never cooked lamb, it’s not the most pleasant smelling piece of meat to cook. It tastes fantastic though, so just remember the end result is better than the process. 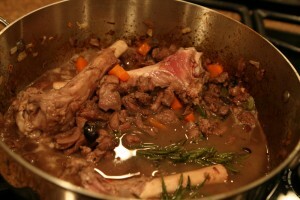 Also, we prefer to have the butcher remove the lamb off the bone since it cuts down on butchering it yourself. And, let’s be honest, butchering lamb meat is kinda gross. Heat the oil in a large pot. Dice and season the meat, then brown it very well. Add the mirepoix (onion, carrot and celery). Lightly brown the vegetables. Add the garlic, red pepper flakes, rosemary and olives. Cook for 15 seconds. 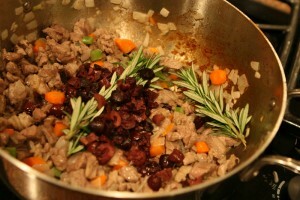 Add the red wine and reduce by half; then add the cream and reduce by half; then add the stock and reduce by half. This takes a while. I won’t tell you how long because it just depends. Just hang in there. It’s worth it! 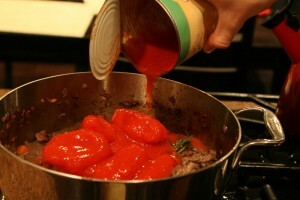 Add the tomatoes and salt/pepper. Cook covered for approximately two hours on a low heat. It’s done when the liquid has reduced by about 80%. 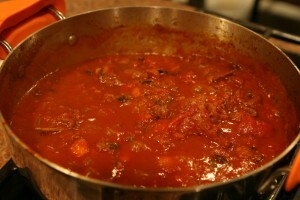 Mash with a potato masher or large spoon to break the meat and tomatoes, into a chunky ragu. We like to combine the pasta and lamb ragu together and then serve. Now this is what I call pasta perfection! Oh yum! That just made me really hungry!!! My goodness! That looks like a HUGE project! Looks great! oh my it looks fab!love the pics I wish I could cook like that!I am going to have to check you out more often.